This is the bait for the online contest that was circulating online. Unfortunately, PAL officials denied that they had launch such contest on the internet. Dear Passengers. 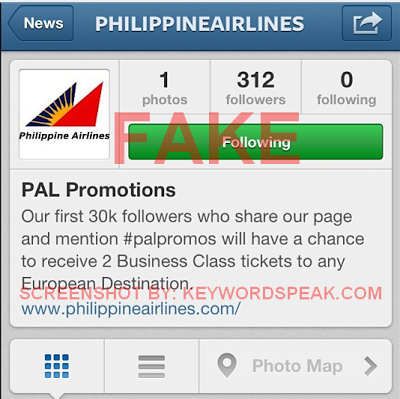 There is a HOAX PROMO going around regarding Instagram. This is not an official contest released by Philippine Airlines. Dear Passengers. There is false contest circulating regarding a contest involving Instagram. This is not an official contest launched by Philippine Airlines. Please disregard. Any official contest launched by Philippine Airlines will be announced on the official website at www.philippineairlines.com, Facebook (flypal) and Twitter (flypal) accounts. PAL official website and social network accounts are listed below. As of todate, PAL has no official Instagram account.